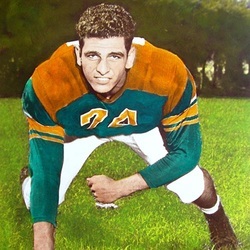 A Miami native, Charlie George played guard and tackle for the University of Miami from 1945-1951. Even at 6' 0" and 197 lbs. George possessed excellent strength and speed. he was a teammate of fellow Hall of Fame inductee Hal Allen and played in the 1951 Orange Bowl and the 1952 Gator Bowl.Coming out of high school, George was on of the most sought after recruits n the nation and received numerous scholarship offers. George had an excellent college career and after graduation he remained in Miami.